Aquatic ecotone habitats, like wetlands and phytotelmata, contain higher nutrient levels than are found in open waters resulting from degradation of organic materials like leaf litter. This allows much larger autochthonous yeast populations to develop than in more traditionally studied open water habitats. The single-celled morphology of yeasts makes them naturally better adapted than filamentous fungi to fluid habitats. Heavy influence exists from the extensive phylloplane yeast populations, which have also received little study until recently, and of animals attracted to these resources. Debaryomyces hansenii, Pichia membranifaciens, Candida spp., Papiliotrema laurentii, Naganishia albida, and Rhodotorula mucilaginosa were the most common yeasts detected in these habitats. Some species have a strong association with specific types of aquatic ecotone habitat like Kluyveromyces aestuarii in mangroves, Scheffersomyces spartinae in salt marshes, and Kazachstania bromeliacearum in bromeliad phytotelmata. 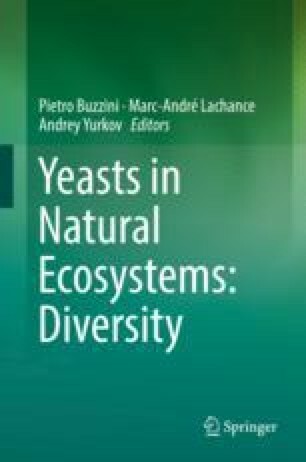 Yeast diversity in aquatic ecotones is very rich in species occurring at low frequency making these habitats good targets for bioprospecting. The studies of estuaries, mangroves, salt marshes, bogs, and phytotelmata resulted in a list of over 270 identified yeasts and many additional unidentified cultures such as those reported as Candida spp. and as the former polyphyletic genera Cryptococcus spp. and Rhodotorula spp., many of which have since been described as new taxa.